Have you ever noticed your child’s skin looking red and blotchy where it touches their diaper? Do you find certain lotions and creams cause irritation? If so, your baby might have sensitive skin that’s affected by their diaper. Diapers are super fancy these days. Many have gels and various new kinds of technology to help them stay drier for longer. However, for a small percentage of babies, these innovative ideas might actually be causing a problem. My baby hated wearing diapers, so I tried what felt like a million different brands — both cloth and disposable. Whenever I could, I just left the diaper off for as long as possible. This helped to reduce the diaper rash, but sadly a baby can’t be diaper-free all the time. If you suspect your chosen diapers are behind your baby’s irritated skin, there are now some great alternatives available. Use the links above to check the latest prices or read our in-depth diapers for sensitive skin reviews below. How Do I Know If My Child Has Sensitive Skin? A baby’s skin is fragile because it’s still developing. Most of the time, skin irritations are temporary phases as your child gets used to the world around them. However, if you notice your baby reacts to many new products, they may have sensitive skin. We all use the term “sensitive skin.” It’s written all over wipes, diapers, and cream brands. But what does it really mean? The truth is, it can mean a lot of things and manifest in a variety of ways. Eczema often begins in the early years. 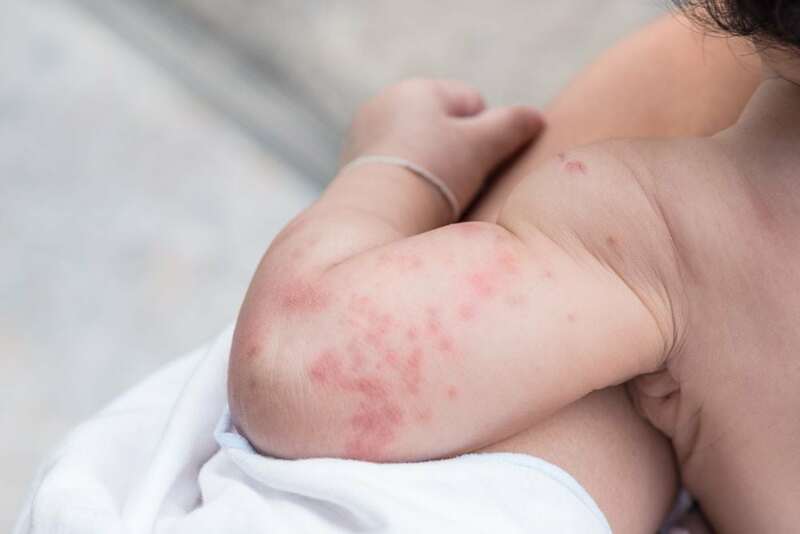 It can run in families, so if you or a relative has been troubled with this skin condition, your baby could be more susceptible. It can be described as red patches of dry and itchy skin. In babies, it’s the legs, arms, and cheeks where it tends to flare up, but it can crop up elsewhere on the body (source). Eczema is a condition which many children do grow out of. Diapers themselves can’t cause it, but if they’re fragranced or made of certain harsh materials, this could trigger or aggravate symptoms. Diaper rash can be bad. Many of my biggest mom-guilt moments were related to diaper rash. I was crushed by the fact it was there in the first place, and even more crushed that I had to make my baby put another diaper back onto their already tender skin. Diaper rash is common among babies. 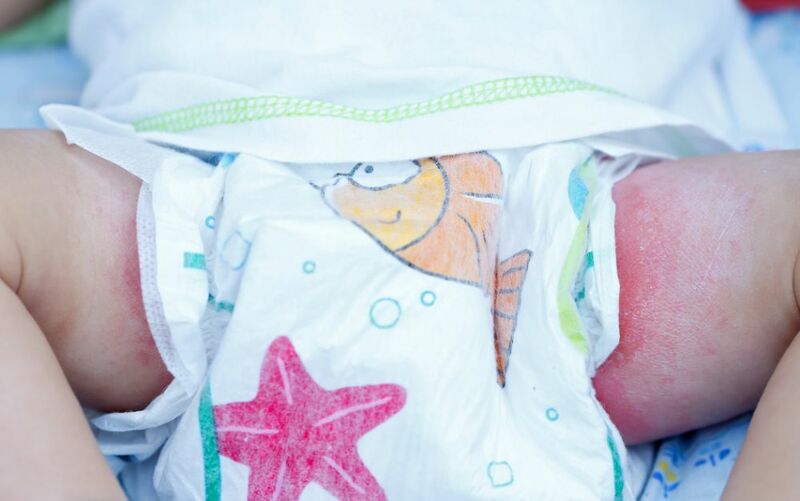 If your baby has it, you’ll notice red and angry-looking skin within the diaper area. It can cause discomfort, so you may notice more fussiness than usual (source). The most effective way to prevent diaper rash is to change babies often. It’s typically as a result of prolonged exposure to moisture, like urine or sweat. However, it can also be caused by a reaction to the diaper itself. 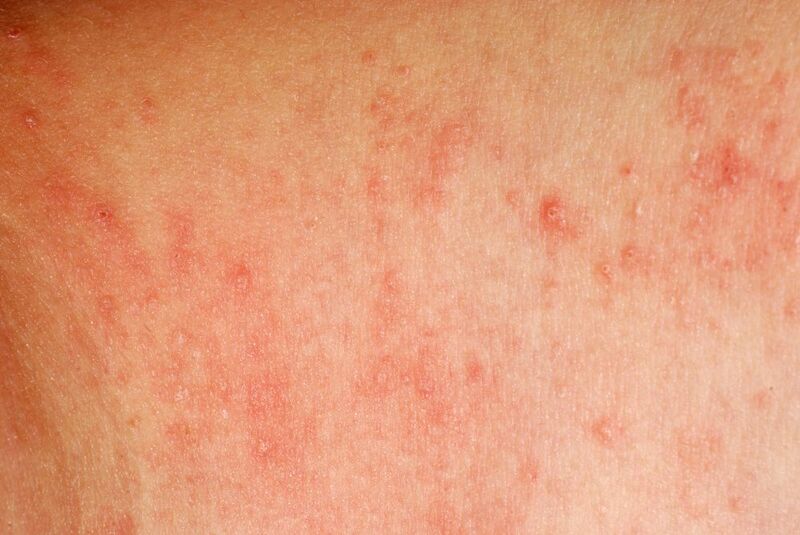 Our bodies produce hives when we have an allergic reaction to something (source). Food, bug bites, medication or certain materials can cause hives. If your child seems to suffer frequently from hives, you may want to start keeping a note of products you use and the foods they eat. Try looking for signs of insect bites on their skin. After monitoring for several days, you might be able to pinpoint the offender. Allergic reactions can be very dangerous. If your baby begins to change color or seems in distress, you should contact your doctor immediately. Although it’s rare, some babies can be allergic to the materials inside a typical diaper. If your child gets red blotches around this area, no matter how often you change them, it could be an allergy. These blotches may be tender and uncomfortable so your baby could cry when you touch them. If this happens on a regular basis, you might want to try a different brand. If it persists, you should call your pediatrician. The debate between cloth diapers and disposable diapers is an ongoing one. Both options have advantages and disadvantages for you and your baby. But when it comes to sensitive skin, can one be better than the other? If you have tried several disposable diaper brands and nothing seems to help with your child’s reaction, it may be from the materials inherent to disposable diapers. In that case, switching to a cloth diaper might be the answer. However, if your child’s skin irritation is the result of sensitivity to heat or moisture, it may be better to keep with disposable brands. Cloth diapers tend to be less absorbent than disposable diapers, making it easier for your child to be affected by moisture. If your child has sensitive skin, finding a suitable diaper that works is essential. But it can be pretty frustrating if you don’t know where to start. To give you an idea what’s around, I’ve put together my favorites. 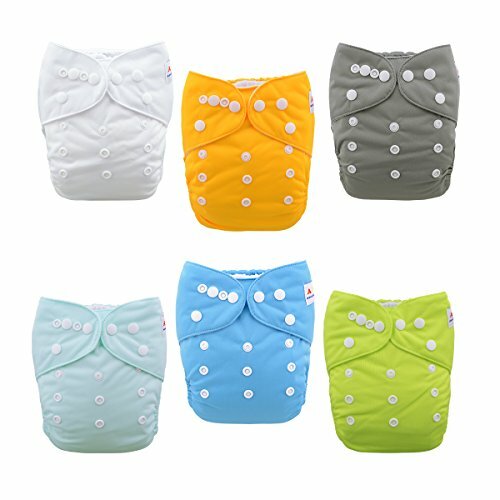 These cloth diapers offer a two-part system, giving you scope to adapt to whatever products work best for you. The diaper consists of a waterproof and washable outer layer that’s designed to channel liquids away from your child’s skin. Inside, you pop in a reusable insert to help soak it all up. For the insert, they offer several options. The diaper offers a tri-layer microfiber material as standard, yet alternatives include those made of 100 percent bamboo charcoal. Using all-natural materials should be kinder to the skin, which is perfect for tots who are ultra delicate. These come in some adorable and funky styles for both boys and girls, and there are plenty to choose from. Because they’re adjustable, they can be tailored to fit your child properly, which may reduce the potential for chafing. More economical than disposable diapers. Snap fasteners to help reduce diaper accidents. Some parents felt the different snap positions were tricky to learn at first. These diapers are extra soft and absorbent, while also being made specifically for babies with sensitive skin. 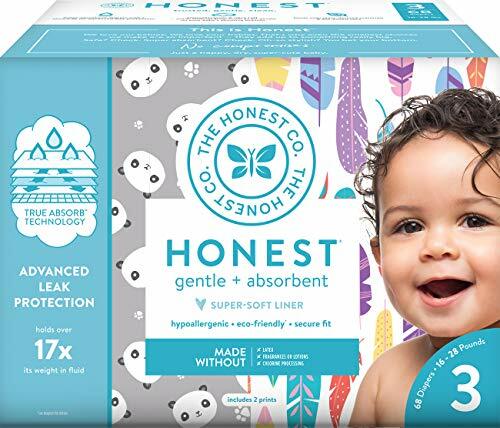 The diapers have a back sheet designed with breathable technology to allow for greater airflow — keeping baby’s bottom dry and reducing the chances of diaper rash. If irritants are a problem for your little one, these diapers may appeal to you — they’re free from allergens and perfumes. They’re also suitable for kiddies weighing from four to 66 pounds, meaning they can follow your child from birth to potty training. What stands out for me is that they have the Nordic Swan eco-label. This means they’ve been produced using sustainable methods — that’s less impact on the environment and great for moms keen on saving the planet. Suitable for day and nighttime use. Wetness indicator — saves you peeking. Users say they’re incredibly absorbent. No bleaching during the manufacturing process. Some moms experienced frequent blowouts. Hypoallergenic diapers are designed with sensitive babies in mind. These diapers are made with a host of plant-based materials, reducing the possibility of any reactions against synthetic materials. What’s neat is that they’ve kept away from latex, chlorine, fragrances, and lotions. This will reduce your child’s exposure to anything that can potentially aggravate delicate skin. The inside liner is designed to draw liquid away from your child’s body — pulling moisture from the skin. The diaper is also made to hold 17 times its weight in liquid, which makes them ideal for nighttime use. 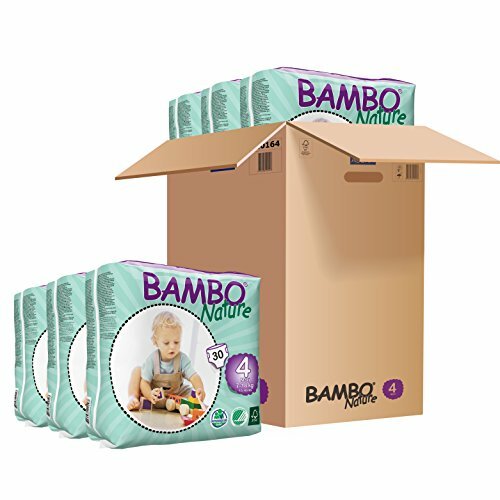 For the eco-conscious parents, the bulk of this diaper is made with sustainably harvested wood pulp. The core includes renewable materials that will further reduce your impact on the environment. But you just have to love the super-cute designs available, which are way more fashionable than your traditional white diaper. Plus the elastic cuffs offer a greater comfort factor for your child and also help to avoid any leaks. Available in many local stores. Made with citrus-based odor inhibitors. Stretchy side-paneling helps to protect against blowouts. Only available for children weighing up to 35 pounds. When it comes to cost, cloth diapers have no competition. These are about as simple as it gets and should help you protect your baby’s skin and your pocket. 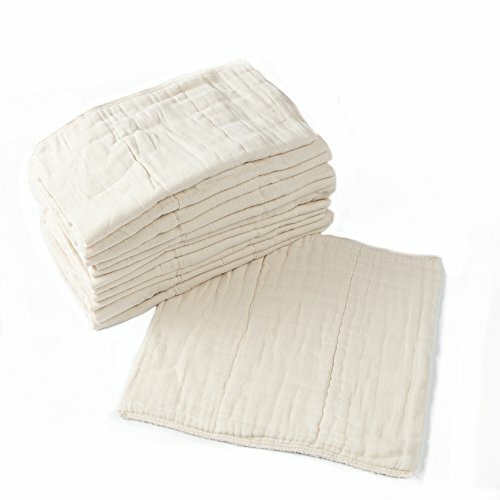 Made of premium, unbleached cotton, they’re perfect for babies sensitive to any kind of chemical. Because they’re pre-folded, you can easily adjust them to fit your baby perfectly, reducing leakages. 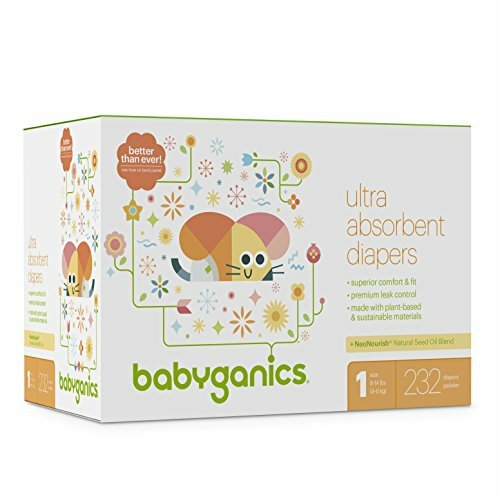 Designed by moms who were fed up with what the market had to offer, this brand focuses on maximizing absorbency, which should help keep your baby’s bottom drier. Full detailed instructions are provided, explaining how to care for the diapers to ensure they work as intended. The natural oils are stripped away from the material to allow more liquids to be locked into the diaper and kept away from your baby’s skin; the lack of moisture cuts down on irritation. What’s great about these cloth diapers is that as your little one outgrows them, they can continue to be used as inserts — saving you even more money. Doubles as a burp cloth. Cloths are pre-shrunk — no surprises after the first wash.
Moms love how soft they are. Eight-layered cotton center for more absorption. The thicker material makes them a little bulky. Diaper clips must be bought separately. There are a lot of components you might want to avoid when your baby has sensitive skin, which is why many diapers seem to have a premium price tag. Babyganics are made without using latex, chlorine, or petroleum-based lotions and fragrances — just simple, plant-based materials. The company also aims to keep the price down, which is great for moms who want to address their baby’s delicate skin without spending a fortune. The diapers are of a thinner design, which should fit closer, making them more comfortable for your little one to wear, and also reducing leakages, blowouts, and potential chafing. Another nice touch is the blend of natural plant and seed oils, like cranberry, tomato, and sunflower, which has been added to nourish the skin. The wetness indicator on both sides is a fab feature for making it easier to see when it’s time to change. They can be found at many local stores, which means you never have to worry about using a different brand in a pinch. If you order online, you can also find great deals. Parents noted how absorbent these diapers are. Stretchy adapt to your child’s shape. Can be bought in bulk for extra savings. If your baby is having skin troubles, particularly near his or her diaper area, it may be due to sensitive skin. If so, changing to a diaper with more natural materials or better absorbency might help. My personal favorites are the ALVABABY cloth diapers. They could save you money in the long run, are eco-friendly, and let you choose the insert that’s best for your baby. Because they fasten securely with snaps, you shouldn’t have to worry too much about your baby’s diaper coming undone or rubbing against their skin either. Does your child have sensitive skin? If so, what kind of diapers do you use? Have they helped? Share your thoughts and suggestions in the comments below!